Native to Europe, Turkey, and Georgia. Introduced and naturalized in North America. This is an erect, perennial forb that rises on usually 1 stem from fibrous roots with short rhizomes. It can be 8″ to 24″ tall but is usually no more than 12″ tall. 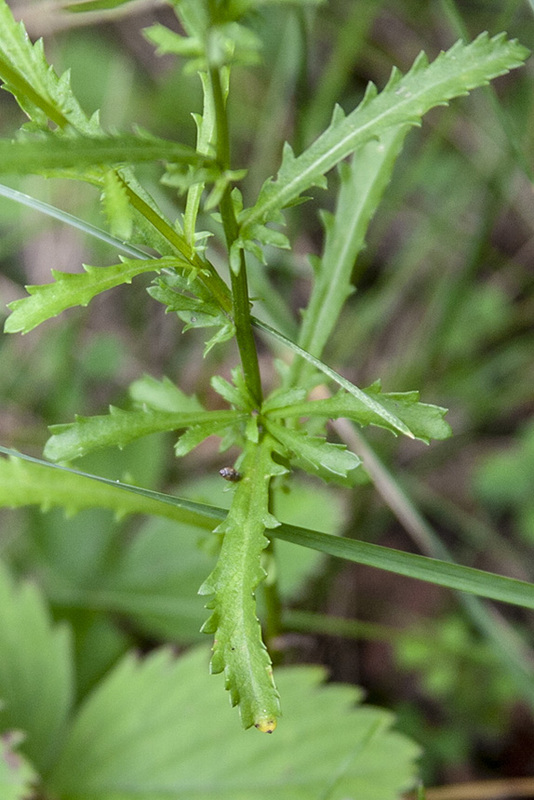 The stems are erect, hairless or inconspicuously hairy, usually unbranched, and angled. Basal leaves are spatulate or inversely lance-shaped with the attachment at the narrow end, ½″ to 2″ long, ⅓″ to 1⅛″ wide, but usually no more than 1⅓″ long and ¾″ wide. 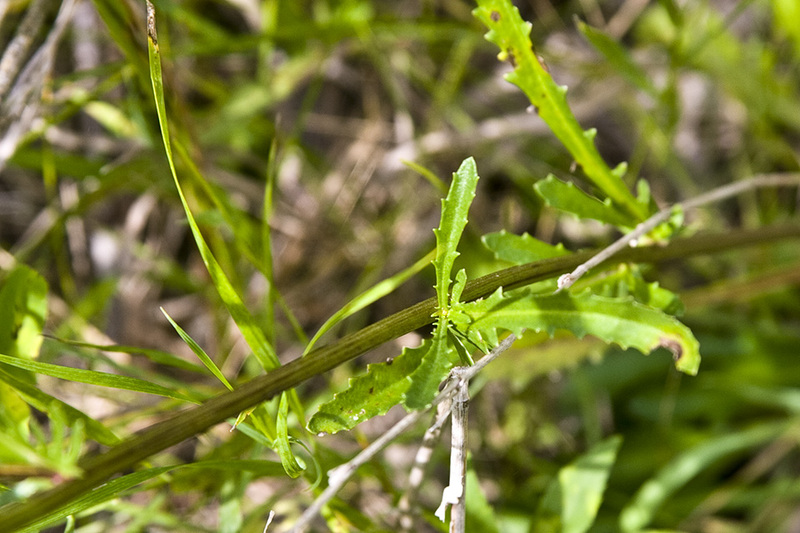 They are on leaf stalks that are ⅓″ to 4″ long but usually no more than 1⅛″ long. The margins usually have 3 to 7 lobes per side, with or without irregular teeth, or are unlobed and irregularly toothed. Stem leaves are alternate, and inversely lance-shaped, spatulate to lance-shaped, or linear. They are 1⅛″ to 3⅛″ long, and 1 ⁄16″ to 9 ⁄16″ wide, becoming smaller and fewer as they ascend the stem. Lower stem leaves are on short leaf stalks, the stalks becoming shorter as they ascend the stem. Upper leaves are stalkless. Margins of the mid-stem leaves are usually irregularly toothed around the entire margin. The upper and lower surfaces are hairless. The inflorescence is a single flower head on a long, slender stalk at the ends of the stems and branches. 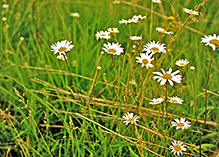 The flowers are 1″ to 2⅓″ wide, composed of 15 to 35 white ray florets surrounding a flattened, ¼″ to ¾″ wide disk of numerous yellow disk florets. The rays are ½″ to 1⅓″ long though usually no longer than ¾″, and are toothed at the tip. 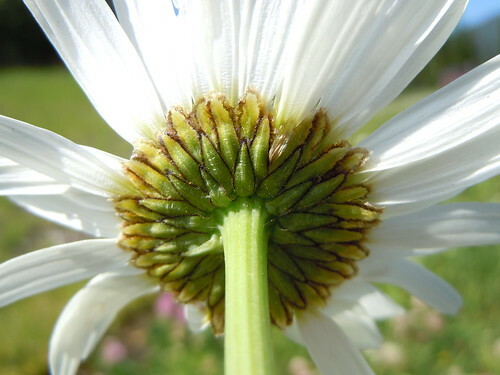 At the base of the flower head are several series of overlapping, green bracts with brown margins. Dog-fennel (Anthemis cotula) leaves are feathery, 2 to 3 times pinnately-divided, not lobed. The ray flowers are shorter, stubbier. 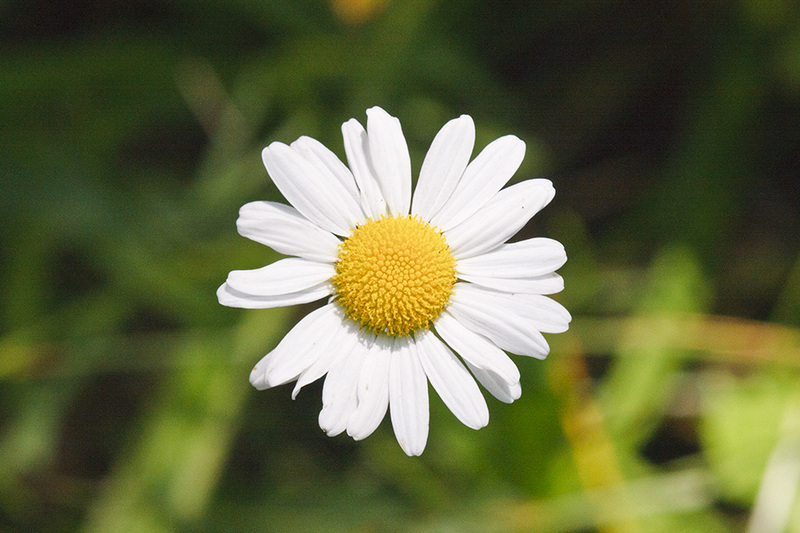 Wild chamomile (Matricaria recutita) leaves are feathery, 2 to 3 times pinnately-divided, not lobed. The ray flowers are shorter, stubbier. 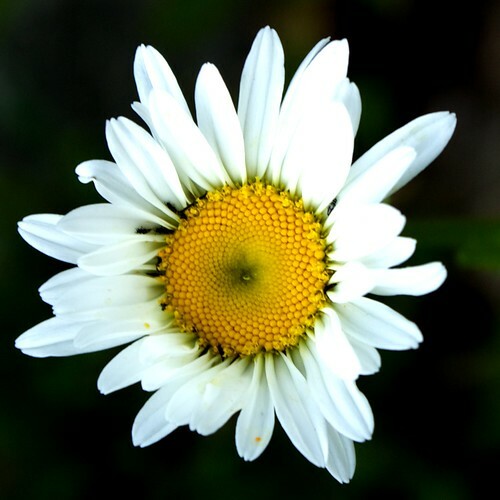 Also known as Chrysanthemum leucanthemum. Introduced rhizomatous perennial, leaves shallowly toothed or lobed, stems 20-80 cm tall, involucral bracts arranged in several series and each bract has a brown translucent margin, receptacle naked, common along roadsides and in pastures (nutrient rich sites). A very common wild flower in Vermont. 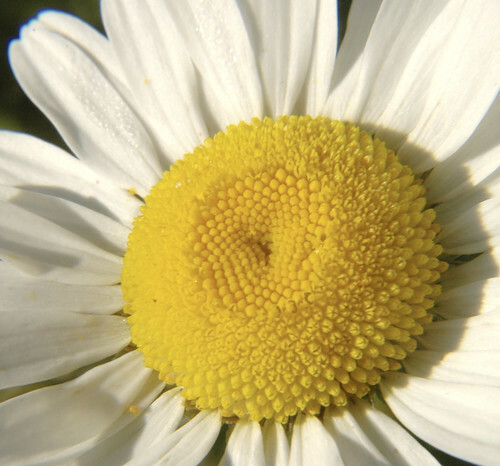 A detailed look at the life cycle of Oxeye daisy (Leucanthemum vulgare). 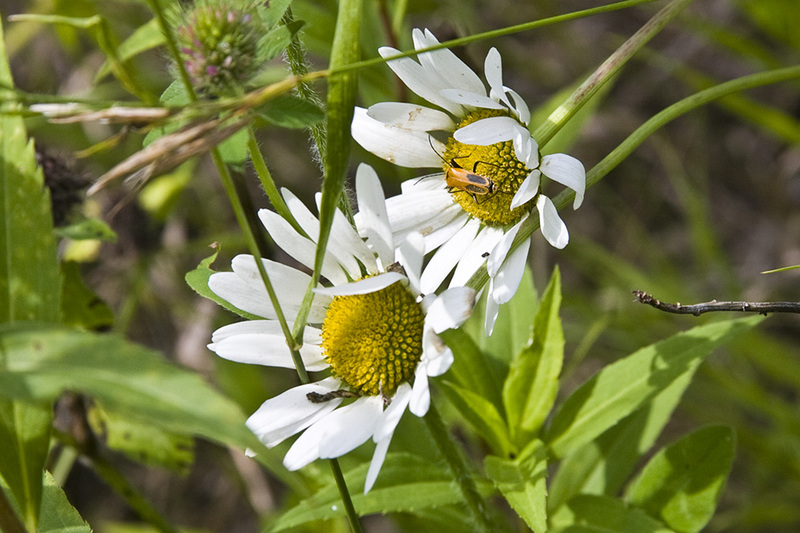 These images can help to accurately identify the plant during different seasons of the year. This video is a first in my wildflower series, as it is the first invasive plant I have filmed and uploaded to my channel. I guess this illustrates my varying goals for posting these videos. Certainly part of the reason is identification and this is why I will document some number of invasive species before I am done. 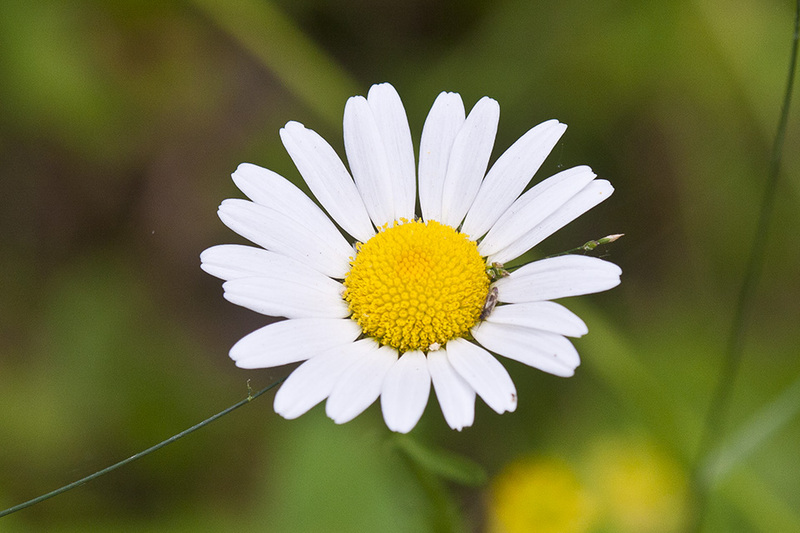 The oxeye daisy, though pretty, is a Eurasian species that heartily invades fields and meadows and displaces native grasses. 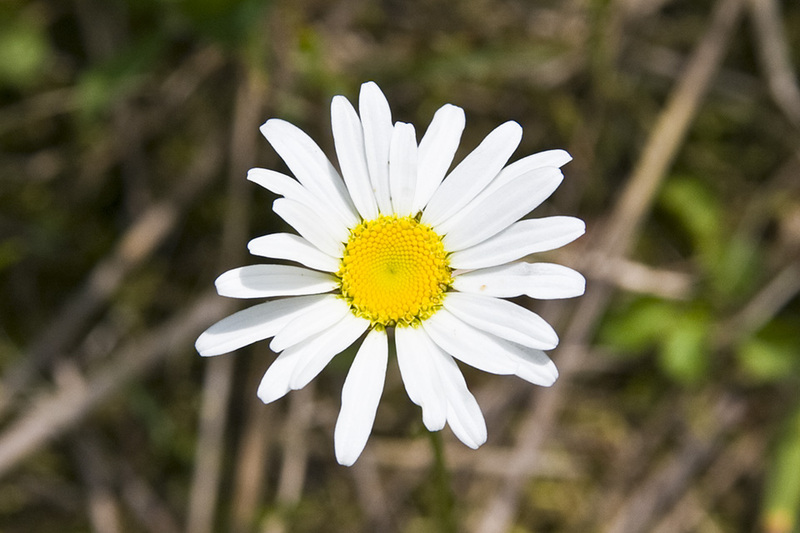 Leucanthemum vulgare, the oxeye daisy, (syn. 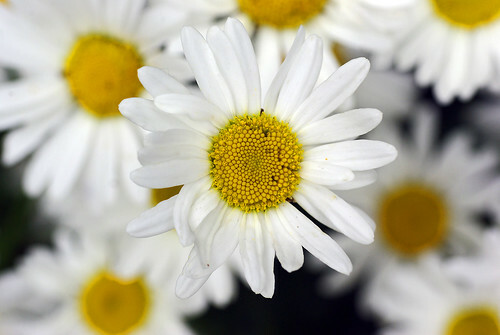 Chrysanthemum leucanthemum). 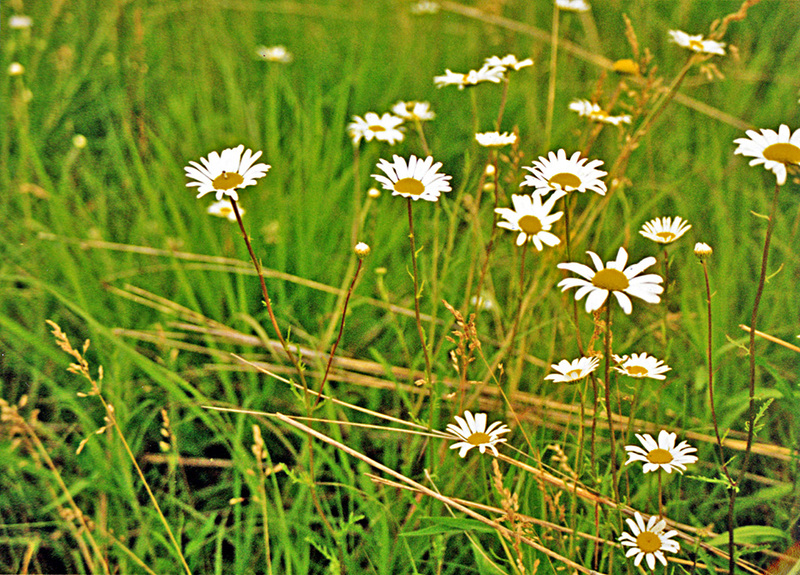 De gewone margriet (Leucanthemum vulgare, synoniem: Chrysanthemum leucanthemum) is een vaste plant uit de composietenfamilie (Asteraceae). The male skipper (Ochlodes venatus) sat on the ox-eye daisy for ten minutes waiting for sunshine. When the sun reappeared his proboscis got busy. Der männliche Falter saß zehn Minuten lang auf der Margerite und wartete auf Sonnenschein. Als die Sonne erschien, wurde sein Rüssel fleißig.